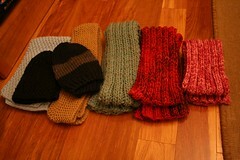 Today was the coldest day all year, so it was appropriate that I sent off some knitted goods to Food & Friends! The organization is collecting handknit winter accessories to distribute to its clients -- chronically ill DC residents that depend on Food & Friends for the delivery of their meals. It was a great way to chalk up some mindless knitting and find good uses for some leftover stash. The two scarves on the left are made of Lion Brand Cashmere Blend that I picked up expressly for this purpose while at Sarah's delightful swap. The middle scarf is out of Lamb's Pride Worsted leftover from an almost-finished secret project, and the pink scarf is from this sweater's remnants. The red scarf is made of yarn left from my Clapotis, the striped hat is made from...uh, can't-remember-exactly-which woolly yarn and the black one is a lace cap in Calmer. I had just washed it to prepare for Winter wear (by me! ), but remembered that it hadn't gotten much use last year. Better that it go to somebody who will appreciate it, says I! Nice job! I never did get it together to make anything for Food & Friends this year, so way to go! those are very nice items to donate. how was the LB cashmere to knit with? i've seen it at Hancock's and Michaels but haven't bought it yet. Hello from a new reader! Thanks for the info, since I live in the area, I will be sure to make note for my upcoming charitable knitting. I also started a club for my students at school, so I am sure they would be more than happy to help as well.